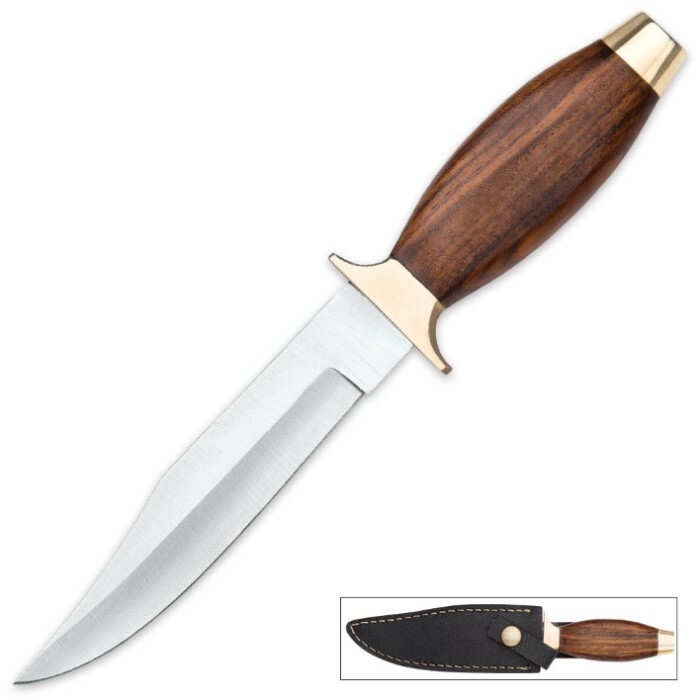 Mountain Man Mini Bowie Knife with Split Leather Sheath | BUDK.com - Knives & Swords At The Lowest Prices! Despite its modest stature, the Mountain Man Mini Bowie boasts big style and ample field capability to match, making it just as impressive as any traditionally sized bowie knife. It features a razor sharp 5” stainless steel blade and a handsome walnut handle, beautifully offset by a gleaming brass guard and pommel. A split leather belt sheath houses the blade, which - combined with the Mountain Man's comfortable size - makes it easy to carry in even the roughest terrain. When you’re looking for an incredibly sharp knife that is easy to conceal and practical, why settle for something plain and utilitarian? With the Mountain Man Mini Bowie, you can have the best of both worlds - beauty and brawn!